Gamma-Ray Bursts are among the brightest explosions in the universe, and in a few seconds they release a tremendous amount of energy, with their light illuminating the path from the source towards us. 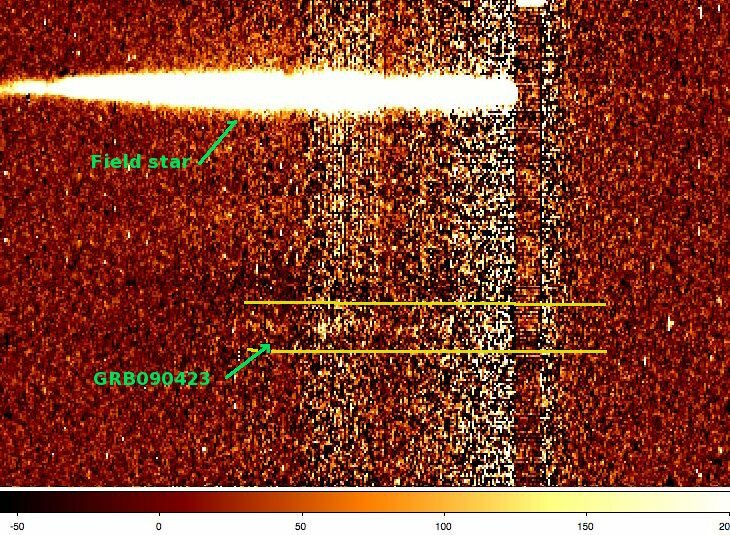 Although these events, as observed form Earth, are rather frequent, on April 23 at 7:55:19 UT the Swift satellite detected one of these events that represented a scientific breakthrough: GRB 090423 (Fig. 1). 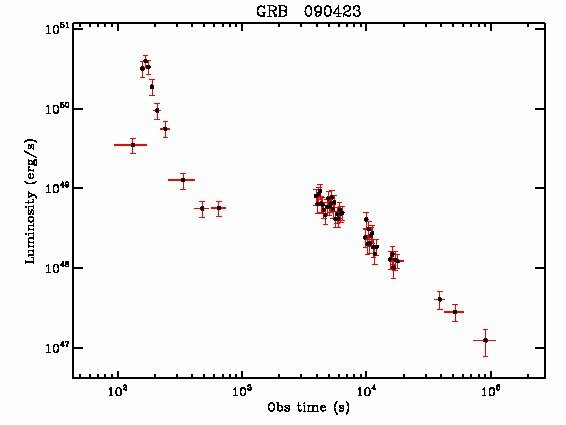 As shown by follow-up observations performed with ground-based telescopes, it was a very distant event, and soon it looked like this was the farthest GRB ever observed. A team of international astronomers led by Swift Italian Team and CIBO, using the AMICI prism with the Italian Telescopio Nazionale Galileo, was able to compute its redshift at about 8.1, corresponding to a distance of more than 80 Gpc, when the universe was only slightly more than 600 million years old (Figure 2). Isotropic-equivalent 0.3-10 keV (observed frame) luminosity light-curve of the farthest GRB yet observed. At early times the ligthcurve is dominated by a large flare peaking at 170 s which corresponds to just 19 seconds in the GRB rest frame. The transition from the commonly observed shallow decay phase into the normal decay phase (power law decay index of 1.3) occurred as early as 4 ks obs frame:this translates into 450 s in the GRB rest frame. "It has been a very exciting night!" says Paolo D'Avanzo, and adds "the detection of this unique event was possible thanks to the efforts of a well trained team that elaborated procedures aimed to follow-up GRBs every time they occur". As Alberto Fernandez-Soto, a Spanish team member, puts it: "it is astonishing to witness how rapidly the universe began forming massive stars, able to evolve and eventually explode in such a violent way". The joint analysis of ground-based data and high-energy data from the Swift satellite will allow us, said Raffaella Margutti, to derive unique information about the physical conditions in the young universe. TNG and its staff allow and encourage ToO mode for observations.